TURTLE ISLAND MEDICINE SHOW is a contemporary fable and cautionary tale inspired by the Lenape Indian origin story, and by current climate reports. The show features whimsical kinetic sculptures, richly painted paper mache masks and puppet figures that range from 12″ to the 16 foot tall Tree of Life. Composer & music director Dean Jones’ inventive score loops together gongs, hoop drum, jaw harp and trombone scats in a medley of live sound. He also supplies voices for narrator and characters. 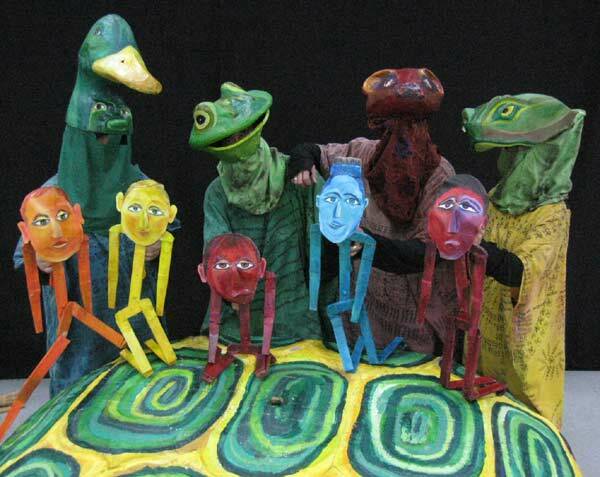 Four nimble, shape-shifting performers bring to life the mask and puppet multitudes. “Turtle Island,” writes poet Gary Snyder, “is the old/new name for the continent, based on many creation myths of the people who have been living here for millennia, and reapplied by some of them to ‘North America’ in recent years. Also, an idea found world-wide, of the earth, sustained by a great turtle.” The Lenape origin story describes a great flood and how various animals try to dive to the bottom and bring up mud. When one of them, Muskrat, finally succeeds and Duck and Frog spread the mud on Turtle’s back, this tiny island grows into a mighty continent. Arm-of-the-Sea carries the tale into the fossil-fueled modern moment where climate change threatens to de-stabilize this Turtle Island home. Toured extensively since its premier in 2006, TURTLE ISLAND MEDICINE SHOW has been featured at such venues as VT’s Solar Fest; First Night, Morristown, NJ; Ocean County (NJ) Community College; The Pennsylvania Renewable Energy Festival; and MA’s Greening Greenfield. The show runs 50 minutes in length and appropriate for schools and family audiences. You can view a short video here.